The recent proliferation of art fairs has impacted the global art market. Many have argued that their rise is a reaction to globalization and the online market; allowing for potential buyers to be exposed to a concentrated number of new artists. The Toronto Outdoor Art Exhibition, the largest outdoor art fair in Canada, has been filling Nathan Philip’s Square with a variety of local talent since 1961. Here are our top picks from this year’s exhibit. Vanessa McKernan. The Queen and The Ghost. Oil and graphite on mylar. 36 x 57”. 2015. Working on unusual surfaces like mylar, linen and wood, McKernan’s ethereal figures are at once beautiful and unsettling. 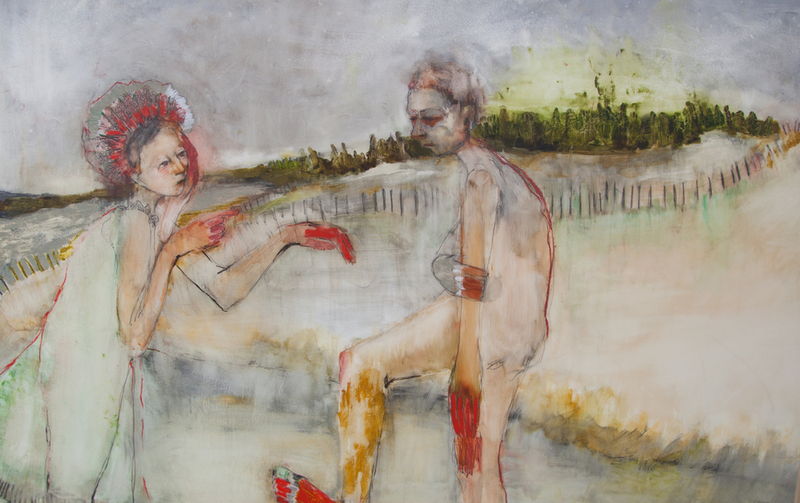 A graduate of Concordia’s drawing and painting program, McKernan’s work explores the nature of people and interaction. Her works have been shown across Canada, the United States and Costa Rica. This is her first time exhibiting at TOAE. Kimberly Rempel’s contemporary abstractions are playful and vibrant, her gestures and colour palettes make the works incredibly expressive. 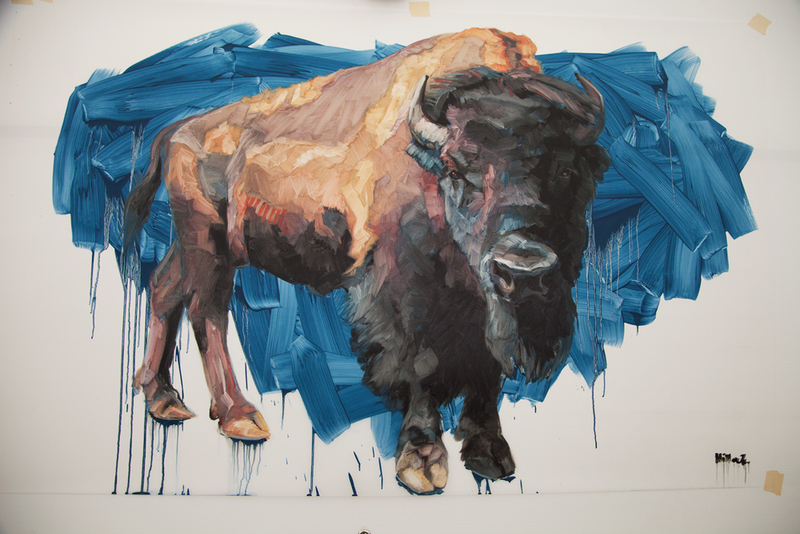 A graduate of Sheridan’s illustration program, she is currently based in Grimsby, Ontario, Rempel has exhibited all over Southwestern Ontario. She is represented by Canvas Gallery in Toronto. A recent graduate of OCADU’s Drawing and Painting program, Meaghan Barry was amongst the youngest artists showing at this year’s TOAE. Her works, however, were incredibly mature. This series of realist paintings explores ideas about archives and the body. She has shown her work throughout Toronto, becoming a familiar exhibitor at fairs like TOAE and the Artist Project. Pat Cantin. Louis P. Oil and Spray Paint on Canvas. 30 x 36”. Montreal-based painter Pat Cantin’s historical portraits blend street-art and expressionism to create a unique aesthetic. Though his strokes and colour choices are more aligned with abstract techniques, his portraits somehow remain recognizeable. His works have been exhibited extensively in Montreal. Kal Mansur. Valkyrie Series. 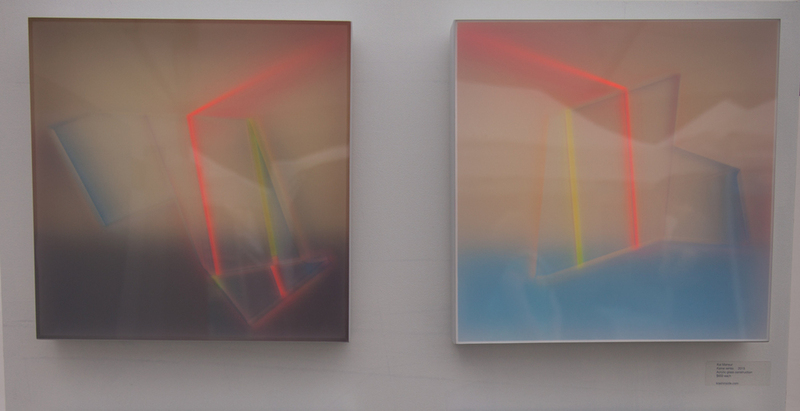 Acrylic glass construction, 2015. Undoubtedly one of the most unique processes at TOAE this year, Khaled Mansur’s abstract sculptures are one-of-a kind. The three-dimensional workings are in-laid under plexi-glass, imparting a luminous day-glo effect on the work and bringing a depth beyond the two-dimensional face. His works have been exhibited extensively across the United States and Europe. Susanne Clark. Psychomachia. Acrylic and gold-leaf on canvas. 30 x 30”. 2015. 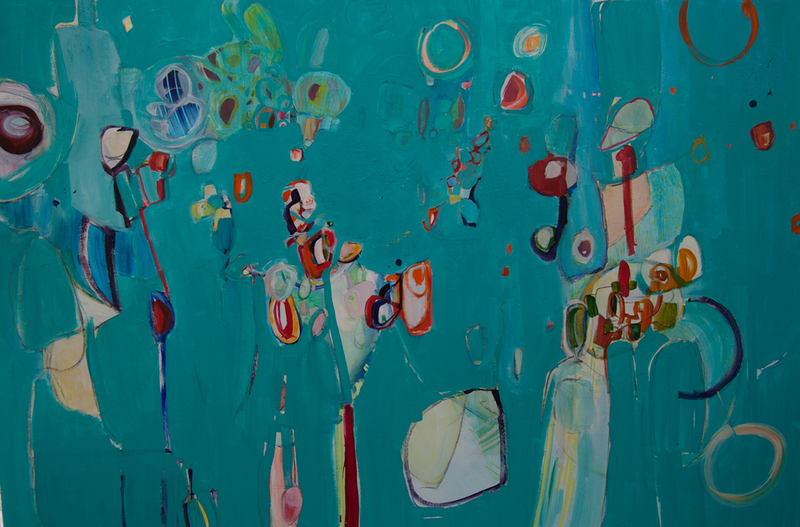 Susanne Clark’s elegant abstractions show refinement; her unexpected use of colour creates compelling compositions. Originally from New Zealand, Clark studied fine-art at Ascura in Thornhill, Ontario. She has exhibited extensively across Canada, the United States and the UK. Frances Hahn. Ice Cream at the Fair. Oil on Canvas. 30 x 40". A graduate of OCAD’s environmental design program, Frances Hahn works in many mediums from textiles to acrylics and oils. Her quirky and playful paintings are minimal but maintain a vibrancy. She currently teaches at OCADU and consults with architectural firm Roundabout Studios. Sarah Hillock’s large-scale portraits of animals are incredibly humanistic capturing these creatures with such emotive expressions. Her impressionistic approach to their portrayal maintains a realistic quality while bringing an energy to the piece. She studied drawing and painting at OCADU in Toronto, and exhibits at many art fairs. She is represented by several galleries like Canvas Gallery and Engine Gallery in Toronto. Isabella Di Sclafani. When Marie Antoinette was a Punk Rocker 5. Acrylic on Panel. 2015. 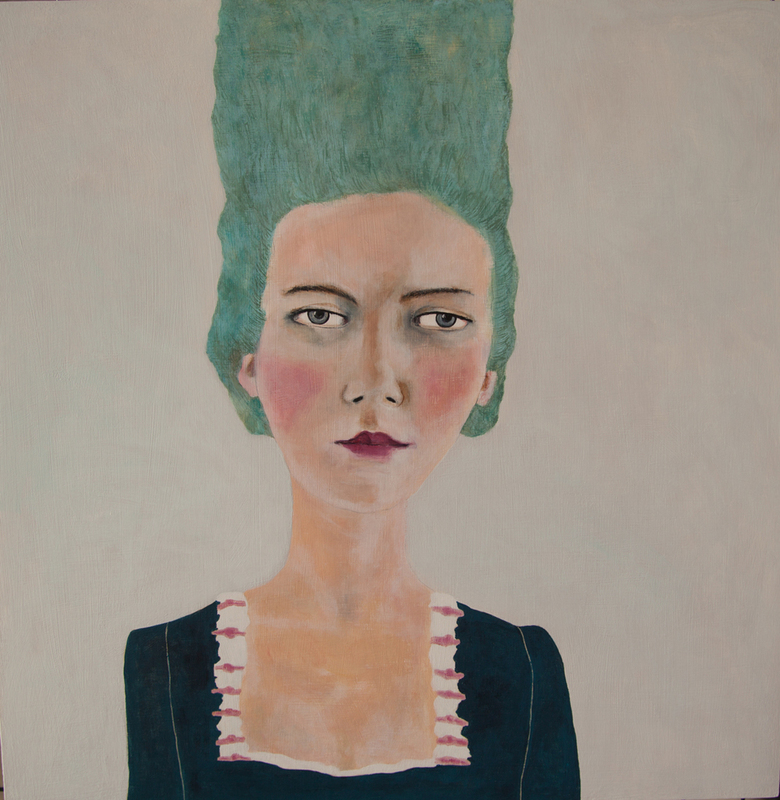 Isabella Di SclafaniBased in Montreal, Outsider artist Isabella Di Sclafani brings a new twist to historical figures through her quirky portraiture. Her works stand in stark-contrast to the Torontonian aesthetics present at the show. Colourful, lively and childlike, her distinct paintings are striking. She graduated the painting & drawing program at Concordia and shows at festivals throughout Quebec and Ontario.